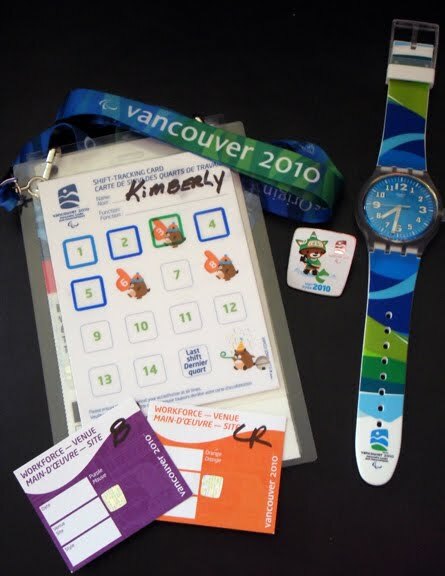 Photo: Pictured in the photo are my lunch/breakfast tickets, my other badge that with each sticker earned me a gift — the Paralympic pin was my first reward and the limited edition Swatch was my final thank you reward! Every work day I hit the road from West Vancouver to Whistler. I parked in lot F, took a van to Athletes Village, then took a shuttle bus to Whistler Creekside. The security tent was always my first stop. Next, I’d have to check in at the Workforce Office, where they’d scan my badge and give me a breakfast and/or lunch ticket, depending on my work shift for the day. Everyday they published a fun two-sided newsletter with news about the volunteers and a featured athlete. I would then head to the transportation tent to check in with my supervisor for the day, get my binder with my assignment details and then go to whatever post I was assigned for that day. I’m very sad my Paralympic journey has come to an end. It was an incredible experience that I will never forget. I had fun meeting people from all over the world. I’m honored to have met and watched athletes with unbreakable spirits who are true role models.